SweetRush takes home two awards in a highly competitive field of nearly 4,000 submissions. San Francisco, California -December 10, 2016 – The Academy of Interactive and Visual Arts recently announced the 2016 Davey Awards winners, and SweetRush was honored with two awards. 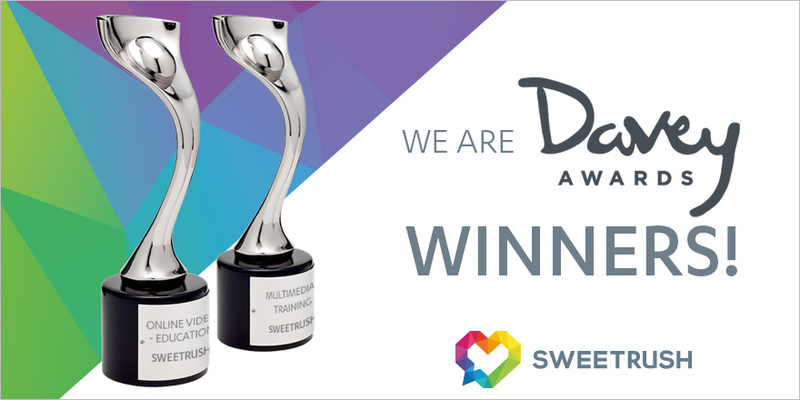 SweetRush received a silver award in the “Online Film/Video – Education” category for a motivational teaser video produced as part of a learning program for Hilton’s HHonors loyalty program. The second award, for a serious game produced for Bridgestone Americas that simulates a day in the life of a tire sales associate, was given a silver in the “Interactive Multimedia Training (Corporate)” category. The Davey Awards exclusively honor the “Davids” of creativity, the finest small agencies, firms, and companies worldwide. David defeated the giant Goliath with a big idea and a little rock—the sort of thing small agencies do each year. The annual International Davey Awards honor the achievements of the “Creative Davids,” who derive their strength from big ideas rather than big budgets. The Davey Awards is the leading awards competition specifically for smaller agencies as they compete with their peers to win the recognition they deserve. Please visit www.daveyawards.com for more information.